Within the vicinity of Toccoa are several springs of mineral water whose medicinal properties may make our town more desirable as a summer resort, some day. One of these is known as Garnet spring, and is beautifully situated about a mile from town. Its water is not very unpleasant to the taste, but has a decidedly mineral flavor. About a half-mile further, near the home of Mr. Littleton Edge, are two mineral springs whose waters leave a decidedly disagreeable “farewell” in the mouth. One of these is strongly impregnated with iron, and the other tastes like sulpher. The water from one of these springs is used by some of our citizens, who find it quite beneficial for indigestion. So far as we can ascertain, none of this water has ever been analyzed. Perhaps it would be a good plan to get some competent chemist to make an analysis of the waters of these springs, for their medicinal properties might be found valuable in the treatment of certain diseases. 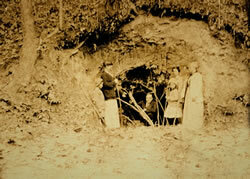 About three miles from Toccoa, on Falls Road, there is a very large and deep spring. This spring is known by the name of Indian Spring. It is thought to have been in the midst of a large Indian camp many years ago, when the many Indians were roaming, long before there was any Toccoa. It has quenched many a traveler’s thirst, as it is near by the roadside. There have been many picnics at this ancient spring. It is about three feet deep, ten feet high and eight feet wide. Someone wrote an account of Indian Spring in the paper the other week, which was very interesting, but I know some incidents, which occurred there several years ago. A young lady who lived on a farm near by went home very hot one afternoon. She went to the spring to bathe herself, but the water was so cold and she was so hot, that she was chilled, and did not live till night. Just above the spring a little boy was drowned. He and his elder brother were coming from Clarkesville to Toccoa, where they lived. It had been raining, and the creek was high. When they were about the middle of the stream the horse stopped to drink; but while he was drinking there came a waterspout, so sudden that it washed them off their horse. The one who was the oldest could swim, but the younger could not, and was drowned. He was floated down stream for several yards, where he was found after three days’ search. Above the falls a man was found murdered, and after a three days’ search one of his horses was found the other one was supposed to have been ridden off by the murderer.